Cheon Nok Tops 100 Billion Won in Accumulated Sales for 3 Yrs. The Korea Ginseng Corp. (KGC)’s “Cheon Nok” that made its debut in December 2014 has achieved a milestone: posting 100 billion won in accumulated sales over three years. KGC launched the deer antler business when it released “Cheon Nok Sam,” a red ginseng & deer antler velvet premium extract, in 2014. In March 2017, the corporation came up with “Cheon Nok Jung,” a red ginseng & deer antler velvet premium extract pill. 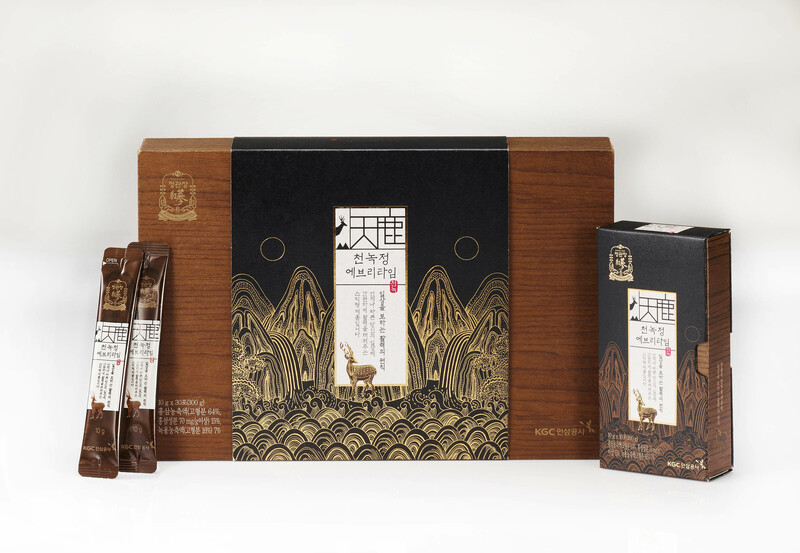 KGC has strengthened a lineup of red ginseng & deer antler velvet extract products under the new brand “Cheon Nok” as the corporation has put on the market an additional product “Cheon Nok Tonic.” Cheon Nok means deer antler coming from the heaven. The brand Cheon Nok has been reviving the deer antler market, which showed signs of decline since the mid-2000s. In reality, the brand has made strides with an annual growth of over 200%. The brand has grown more than 60 percent so far this year compared to the same period last year. KGC says Cheon Nok adopted the same raw material management knowhow as CheongKwanJang. Cheon Nok’s deer antlers undergo safety tests for about 60 diseases from New Zealand government agencies. One of the brand’s representative products is Cheon Nok Jung (tablets), which each contains 2 grams of deer antler extract, the amount recommended by New Zealand’s deer antler association. Cheon Nok Jung also contains a daily allowance of red ginseng extract, KGC said. “Cheon Nok Jung Every Time” is a deer antler extract product that people can carry with ease. “Cheon Nok Tonic” is made with deer antler extract and six-year old red ginseng extract. The product’s addition of boxthorn and other medicinal herbs are known to be conducive to easing fatigue. Riding on the growth momentum of deer antler products, KGC released “Cheon Nok Gang Hwan,” a mixture of deer antler, red ginseng, dodder and other medicinal herbs. The product made with deer tail, a raw material efficacious for enhancing stamina is recommend for men’s use. The product is now available only from duty-free outlets and department stores. Of late, KGC has put on the market the new product “Hong Sam Tonic Chung,” a mixture of CheongKwanJang’s six-year-old red ginseng, cocklebur, and other medicinal herb extracts, in time for spring. The product, designed to enhance immunity and ease fatigue, enjoys popularity among customers who conduct active outside activities. Kim Jae-soo, chief of the ethics management & inspection division at KT&G has been appointed to be KGC CEO. KGC CEO Kim graduated from Korea Maritime and Ocean University and Pusan National University Management Administration Graduate School. Kim, who entered KT&G in 1991, held such major KT&G positions as head of the business planning office, chief of Busan headquarters, and chief of the ethics management & inspection division as well as head of KGC’s domestic business division.